Twin Valley South’s Nathan Osborn gains possession of the ball during the Panthers basketball game at Preble Shawnee. 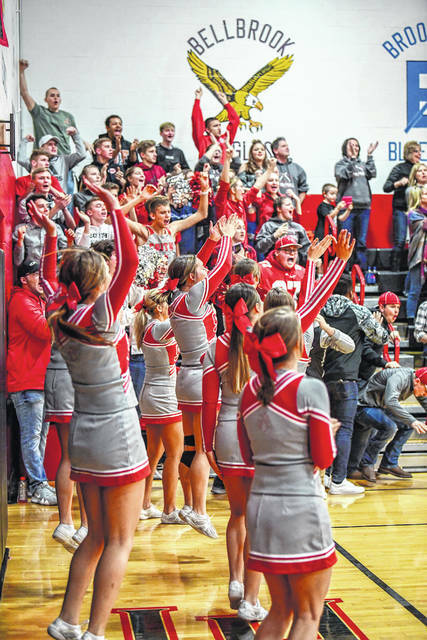 South rallied from a second-half double-digit deficit for a 71-62 double overtime win on Saturday, Jan. 26. 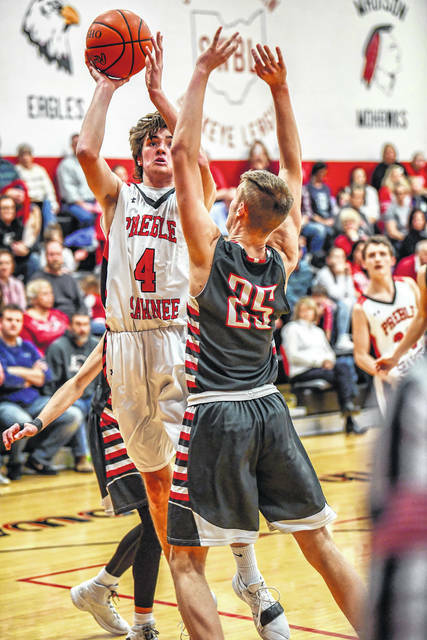 PREBLE COUNTY — Twin Valley South overcame adversity twice this past weekend to pull off a pair of wins in boys basketball games. 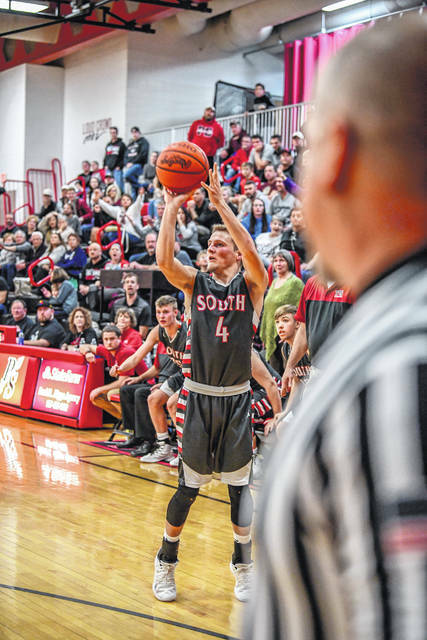 South knocked off Newton 54-39 on Friday, Jan. 25, in a Cross county Conference game then rallied from a 17-point third-quarter deficit to beat Preble Shawnee 71-62 in double-overtime on Saturday. “We had a weekend where I don’t believe we played very well offensively, however, we had some adversity both nights that we overcame that I hope will help us as we move down the line. At Newton on Saturday, Willie Bowman had his best half shooting the ball all year in the first half. 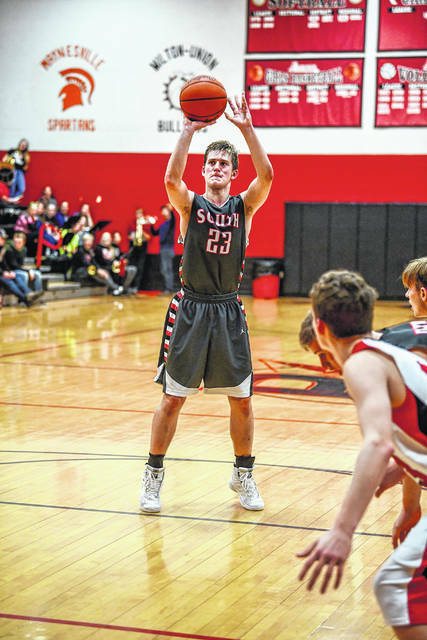 He was basically our offense and had 18 midway through the second quarter when I sat him down with two fouls and the lead,” South coach Tony Augspurger said. In the second half, South faced its first adversity of the weekend. Augspurger said his team had two 4th quarter possessions where while we had around a 10 point lead Newton went over a minute without being able to get a shot off. 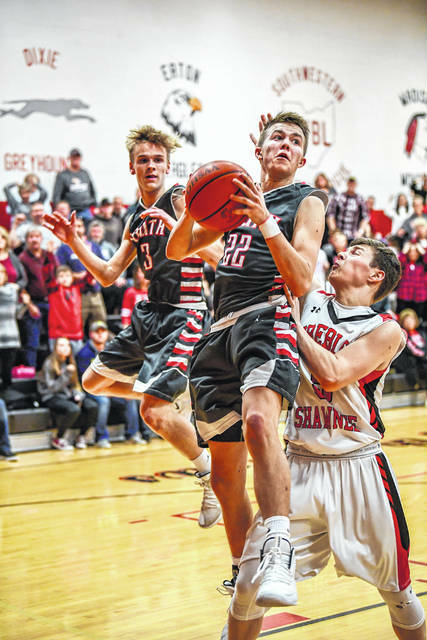 “All of our guys guarded very well, but this game was the longest varsity stretch that sophomore Brayden Marker has played all year, and I thought he was sensational moving on D. Cole Petersen had a good offensive second half with 11 points,” Augspurger said. Against Shawnee, South struggled in the second quarter and had to play catch up the rest of the game. “On Saturday, we jumped out to a quick 12-5 lead on Shawnee and then they went on a tremendous run and frankly we were embarrassingly awful. We scored the first two points of the second quarter to go up 17-14 and then got outscored 16-0 over the final six minutes of the half to go in down 30-17,” Augspurger said. The veteran coach though his team showed toughness in the fourth quarter and both overtimes. The Panthers weren’t going to be denied. South, now 13-2 overall and 6-1 in the CCC, are scheduled to host Mississinawa Valley on Friday, Feb. 1 and will play at Franklin-Monroe on Saturday. National Trail’s boys’ varsity basketball team took advantage of a 22-4 run in the first half to take control against Ansonia. The Blazers went on to post a 51-27 win on the road on Friday, Jan. 25. Ansonia opened the game with a three-pointer to take the lead, but the Blazers responded right away. NT went on their run following the basket and led 22-7 at the end of the first quarter. The Blazers continued to build their lead in the second period, with Cameron Harrison leading the way with 13 points in the quarter. The lead reached 20 in the third period, 33-13, after a steal and dunk from Zach Woodall. NT held on to the 20+ lead throughout the remainder of the game. Harrison led the team with 19 points, followed by Woodall and Adam Eyler with nine each. Woodall also pulled down 12 rebounds and Hunter Michael had 11 boards. 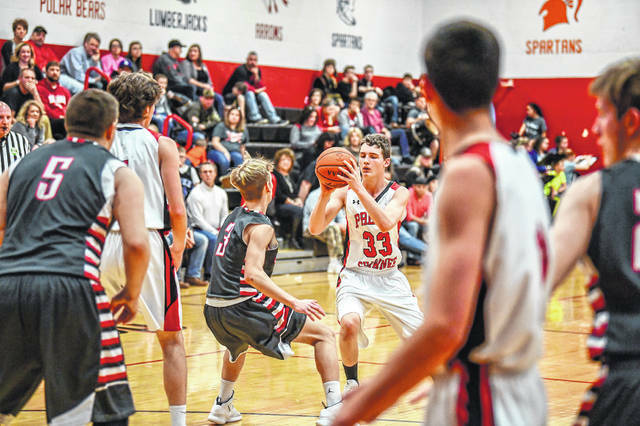 “I felt we were very solid defensively,” coach Mike Harrison said, “forcing Ansonia into tough shots most of the night, consequently they only shot 22 percent from the floor. “We also did a really good job getting to the offensive glass and keeping some possessions alive and getting us some extra opportunities on a night where we didn’t shoot particularly well. National Trail (13-2, 6-2 CCC) is scheduled to host Tri-Village in Cross County Conference action on Friday, Feb. 1. They will travel to Eaton for a non-CCC game on Saturday. On Friday, Shawnee defeated Carlisle 59-43. “We got a nice win against Carlisle. League wins are tough to come by in our part of the SWBL, so we knew we’d have to play well to get it. Our first meeting this year we won in overtime, ” Shawnee coach Dale Spitler Jr .said. Sam Agee led the Arrows with 18 points, JJ Hatmaker added 8 points and 8 rebounds and Bryce Singleton had 7 points and 10 rebounds. On Saturday, the Arrows had a 17-point second half lead, but fell to one of the areas hottest teams, Twin Valley South, 71-62 in double overtime. Bryce Singleton led us with 21 points, Jake Green had 13 points, and JJ Hatmaker added 12 rebounds. The Arrows (8-7, 6-3 SWBL Buckeye) are scheduled to host Milton-Union on Friday, Feb. 1 and will host Tri-County North on Saturday, Feb. 2. Eaton was outscored 20-2 in the first quarter on Friday at Monroe and never threatened the Hornets, falling 70-27. The Eagles bounced back and played much better on Saturday, but lost in double overtime at Tippecanoe, 78-76. The Red Devils hit a 3-pointer with a second left in the second OT to steal the win. Shepherd said his team missed a free throw in regulation and both OT that could have sealed it, but it still took a shot at the buzzer to his team. ”Proud of the way the boys played. They showed a lot of character responding after the loss to Monroe,” he said. Against Monroe, Cameron Lewis led the Eagles with 10 points. Travis Pittman added eight and six rebounds. Against Tipp, James Howard scored 23 points. He also had five rebounds, five steals and four assists. Pittman added 19 points and five rebounds. Owen Baumann scored nine and had three assists. Hunter Frost tallied eight and had three rebounds. Eaton (4-13, 2-7 SWBL Southwestern) is scheduled to play at Bellbrook on Friday, Feb. 1 and will host National Trail on Saturday. https://www.registerherald.com/wp-content/uploads/sites/41/2019/01/web1_TVSatPSBBB19.jpgTwin Valley South’s Nathan Osborn gains possession of the ball during the Panthers basketball game at Preble Shawnee. South rallied from a second-half double-digit deficit for a 71-62 double overtime win on Saturday, Jan. 26.